In many cases it is the colour of the prey that helps predatory birds to detect, pursue and capture them. 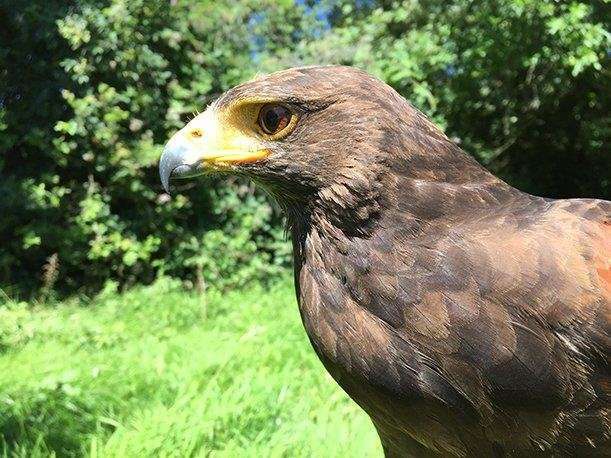 In a new study, biologists at Lund University in Sweden show that the Harris's hawk has the best colour vision of all animals investigated to date – and in certain situations, even better than humans. The findings may help to protect threatened birds of prey against hazards such as wind turbines and power lines. "It's fascinating. I did not think that colour vision would be of such significance, rather that birds of prey simply have better visual acuity than humans and that was the reason they detect objects so early and at a great distance. However, colour is of considerable importance," says Almut Kelber, biologist at Lund University. Normally, the size of the eyes determines optical resolution and thus what people or animals can see. The bigger the eyes, the higher the resolution. The size of the eyes in turn is usually linked to body size. Large body, large eyes; small body, small eyes. Particular to birds is a poor ability in general to see contrasts between different objects. Their contrast vision is almost ten times lower than ours. However, there are exceptions, and the Harris's hawk (Parabuteo unicinctus) is one of them. The study by the Lund biologists shows that if an object is not distinguishable from the background and the colour is approximately the same, it is more difficult for a bird of prey than a human to detect it. If, on the other hand, the object has a different colour than the background, the Harris's hawk can detect it at twice the distance compared to human vision. "It's exciting! The hawk weighs less than one kilo and has small eyes. Nonetheless, it can see many times better than us, even though it is so small and light," says Simon Potier. Up to now, research has not focused on the significance of colour for the hunting success of birds of prey. Researchers have considered that the colour vision of animals has been most important at relatively close range and thus for quite large objects. Simon Potier and his colleague Almut Kelber show in the study that colours are important for enabling birds of prey to detect quarry at a great distance. Good colour vision is also particularly important in environments such as forests, where shadows for example can confuse visual impressions. The findings are based on studies of tame Harris's hawks in France. The location was chosen because falconry (displays and hunting using birds of prey) is forbidden in Sweden. The hawks could fly to one of two perches within a bird enclosure. A uniform colour was projected on a large screen behind one of the perches, and a multicoloured grid pattern was displayed behind the other perch. If the hawk chose the screen with a uniform colour it received a reward, whereas the other choice offered no reward. Once the hawks learned that a uniform colour without a grid pattern meant a reward, the researchers gradually changed the grid pattern's contrast and closed the distance between the grid lines until the hawk could no longer see the difference between the two screen images. "The more fine-meshed patterns an animal can see, the sharper their visual acuity," says Simon Potier, who is a falconer. The findings may have practical importance for conservation, that is protecting threatened birds of prey from disappearing completely. One reason for the decline in the number of birds of prey is that they collide with structures such as wind turbines and power lines. "Once we understand how birds of prey perceive their world, we can help to improve efforts to conserve and protect them," he concludes.